*i6.6.6.6/32       192.168.89.8            65    100      0 ? *i192.168.68.0     192.168.89.8             0    100      0 ? more detail view at the LSP between R7 and R8 , R7 is receiving this labels from R8 to be used as the VPNV4 label. The same shows in R9 now. 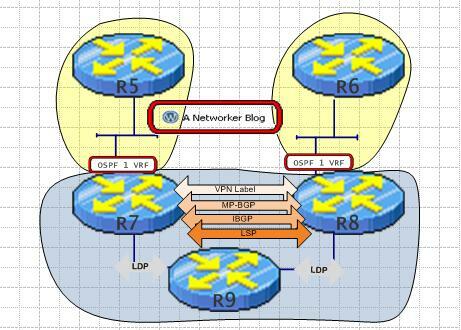 Let change the now, the BGP peering, from R7 and R8 but now using the loopbacks to establish the peering. that we are now configuring MPLS VPN correctly for this particular case. He is sending the packet as Normal IP Packet to R6, and then normal IP Destination based routing is perform on R6,since we just have basic Routing configured there.